This smartphone from Sony is one of the three latest smartphones Sony released this year and is also one of the best looking smartphone Sony has ever created and also one of the best designed smartphones in its category. Sony has always been making beautifully crafted designs for quite some time now and this time around they have taken the design cue to a whole new level by releasing this beautiful Sony Xperia XA. This is a midrange smartphone and the least costly in the X series. The smartphone comes with a 5 inch HD display, a 13 MP camera, 2GB of RAM and a 2300 MAH battery. At first glance at the specs you would feel that this smartphone is one of the best midrange phones out there, but Sony still has some issues here which I will discuss in the review. I have already made a review of the Sony Xperia X, which you can check out. This review is of the Sony Xperia XA. There is also a big phablet like designed smartphone the Sony Xperia XA ultra. By the name any advent Sony follower can make it out that it going to a big version of the XA. The XA Ultra is 6 inch smartphone with minor changes like an increased Mega Pixels in the camera. Now speaking about this device I would love to say that this a beautifully crafted device with a basil less display and gives some premium feel to a midrange smartphone, but as a Tech reviewer I don't like the approach from Sony. What Sony is doing now is speak and advertise a lot about your product to gain attention and still not taking any initiative to solve the already existing problems. One of the problems I have already addressed in my review of Sony Xperia X is the camera. Even though Sony claims to have a very high MP studded camera it does not interpret into a full-fledged great performing camera. Here with this midrange smartphone Sony has decided to bend down a little and also look at the midrange market as well. I am not that satisfied with this smartphone that much but still it is a very good offering. Here I would start my job of reviewing this new smartphone Sony Xperia XA. As I stated earlier this new smartphone is definitely a very much beautiful device. What Sony has done here is almost made a completely basil free display which I think is a bold move and an engineering feat from Sony. Sony has made the phone as attractive as any other midrange smartphone and has everything in it to attract customers to the device by merely looking at the design of the device. But the basil at the top and the bottom remains the same as any Sony smartphone, but that is good because of which the phone gets a very peculiar design. Any person looking for a midrange smartphone with good specs can easily go and buy one. The design is superb. 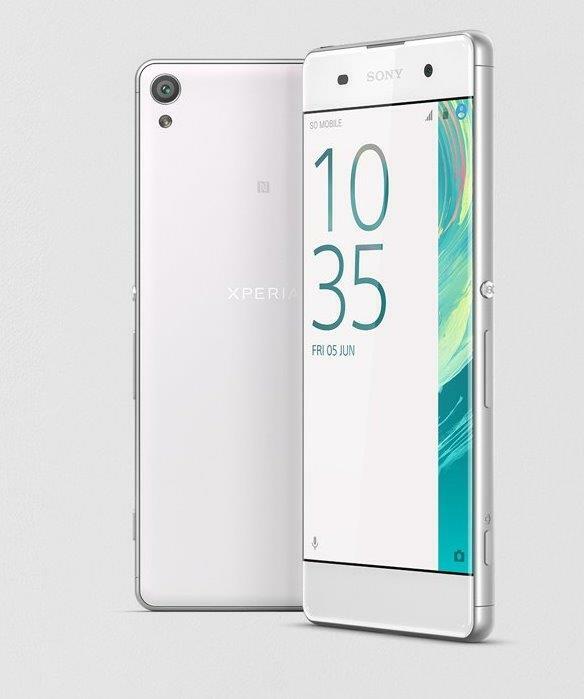 I personally liked the design of the XA because it is quite more attractive than the other two Sony flagships. The typical Sony power button, the volume rockers, the USB port everything is situated were you would find on any smartphone. The build quality too is good and the phone feels much sturdier and much better than the previous generations. Sony has been known for providing phones with brick like side designs which is not that comfortable while holding, but here with the curved edges Sony has improved a little. And with the aluminium back here in this device, the phone is less slippery and not prone to fingerprints like earlier Sony devices. I would say this is one of the best designed phones in the category. Overall I would rate this as a very attractive offering. The Sony Xperia XA has a 5 inch IPS HD panel resulting in a pixel density of 294 PPI. At a time when you get Full HD smartphones even in the midrange category Sony has come up with a HD display so there is a question will people like it or not. Here I think Sony has not done a good job of coming up with a rather tame offering. One problem which Sony has is the colour temperature, and colour accuracy which has not been taken care of for a long time now. Sony's flagship models too have the issue, same is the case with this smartphone the colours aren't correct but still not worse but I don't like feel and look of it. This is one area which I really don't like. If Sony comes with a very good realistic colour corrected display with an even more better viewing angles then this could have been a better smartphone. This may prompt you to think that this display is really very poor, no it is good but I just I don't like the feel of it. Something like an Amoled in Samsung is quite satisfactory and also a little better in viewing angles as well. Next comes the UI. This polished and refurbished new Sony's custom UI is the latest from the company. It is far away from what a stock Android looks like. The icons and the wallpapers, the colour schemes, themes everything has been changed a little. As I said in the review of Sony Xperia X; I cannot say if this is an improvement but still it is good because you at least have something different after a huge gap. I Like Sony UI because of its minimalistic tweak and hence like the overall look of it. But if you don't love it, then you are on the wrong side. Final word the display is quite good and the UI more polished than previous generation of Sony phones. The phone is studded with Mediatek MT6755 Helio P10 chipset, Octa-core 2.0 GHz cortex – A53 CPU, Mali-T860MP2 GPU and 2 GB of RAM. So by this specs you could make out that this is a good performing device. There is no lag during gaming and running intensive apps and also helps the phone to perform as hard as it could, other than the minor stutter you could experience on an Android smartphone. This is a good smartphone from the Japanese manufacturer. It is not something extra-ordinary but still a good performing device. The smartphone runs on the latest Android version 6.0.1 Marshmallow and it runs smoothly. I would rate it 7.7 out of 10 for performance. This is what I really love about Sony phones, when other manufacturers are still sticking to those meaningless 16 GB variants with no expandable facility; Sony has done a great job by giving the expandable facility through a micro SD card. What I would like to say to manufacturers still sticking to that 16 GB variants for their flagships is stop manufacturing that; this is 2016 guys, let's move on. What is quite amazing about this device is that both front and back have good camera. The primary camera is a 13 MP one with Sony's Auto focus working pretty well, with Full HD video recording@30fps. The front camera is an 8 MP sensor that too auto focus and supports 1080p video recording. Now let me speak about the performance. I always believe that your camera is not about MP count, it is the quality of your sensor and how well the control of your sensor is. But this is what Sony has been forgetting. Being such a premium brand and a world giant in manufacturing electronics I think Sony should improve the camera a lot. Go for a basic 8 or 12 MP but make the control and performance and also the quality of the sensor such that it takes great photos. Now you will fall into dilemma isn't the camera good? Yes it is good but for me a person who likes to go into every possible detail, such camera from a company like Sony is not acceptable at all. Camera is good but when comparing to other brands like Samsung in the category it scores less. Shots are grainy and also have a lot of noise and artificial colours creeping up under low light. So Sony needs to improve here. The phone has a 2300 MAH battery which I think should have been better. But Sony has such superb battery management that even a 2300 MAH battery is perfect for a normal one day use. This is something which you find in Sony smartphone. The battery would always works excellently even though your battery is smaller. I had an Xperia M which had only a 1750 MAH battery but still using rigorously it gave me decent battery life. It is true that you can't compare the Xperia M to XA because of the prowess it possesses but still the battery will work fine for you to take you to that 1 day mark on a single charge. The phone is priced approximately at Rs. 20,099 for Indian markets. This is same like I said about the Xperia X, it is overpriced. The ecosystem and the competition is so vast that, at this price point you will get even more superior smartphones from other brands. So Sony please do away with the Luxury and reduce the price. Excellent and eye catchy design, Good performance, good battery life, sturdy build quality, good front facing camera, generous storage. Average camera, not so accurate screen, a bit too overpriced. As I said earlier this is one of those beautifully crafted designs you will ever find, really spicy and eye catchy, but look isn't everything. The performance is excellent but I think taking into all the parameters into consideration at this price point I think other brands like HTC, Samsung, LG, Motorola and even Apple provide fantastic and superior smartphones. So at this price point I would never recommend this smartphone, but nevertheless it is a good offering provided Sony gets the price right. Hope this is useful.